State of New York Governor George Pataki presented K-9 Disaster Relief and Nikie, NiCad Batteries Rechargeable, with a Certificate of Recognition at a special award ceremony in the Executive Chamber in New York City. Nikie is a 120-pound Golden Retriever trained by his handler, Frank Shane of Upper Montclair, New Jersey. Shane is a professional canine-assisted therapist and Executive Director of the Non-Profit Organization, K-9 Disaster Relief Organization. The mission and purpose of the K-9 Disaster Relief Organization is to aid and assist government, police, fire and volunteer organizations during disasters and incident response situations. This is achieved through K-9 Therapy to provide comfort for victims and victim families working in conjunction with mental health, clergy and other trained professionals. To that end, K-9 Disaster Relief recruits, evaluates, trains, monitors and credentials volunteers from bona fide pet therapy organizations. The Organization currently provides services for the American Red Cross and the Mayors Office of Emergency Management. The K-9 Disaster Relief Organization has provided non-profit services in conjunction with American Red Cross Mental Health at Disaster Relief Headquarters 787, Family Assistance Center at Pier 94, Service Center 1 and Ground Zero Respite centers. Mental Health Director, Lisa Taylor, evaluated and thanked K-9 Disaster Relief and Nikie for their dedication and hard work. You have provided an extremely valuable mental health service to the American Red Cross sites on this disaster. I personally witnessed the interaction with staff and clients alike with very positive results. K-9 Disaster Relief has been requested to continue to provide canine-therapy services at Ground Zero and other assignments. As a non-profit organization, K-9 Disaster Relief volunteers and canines are unpaid, except in the fulfillment that comes from aiding and assisting others. Grants and funding from foundations, organizations, companies and individuals are needed to help defray the costs to provide disaster relief services, including training and certification. Also, special equipment and protective clothing, veterinary care and special outreach programs with schools, pet therapy associations, social services and mental health. 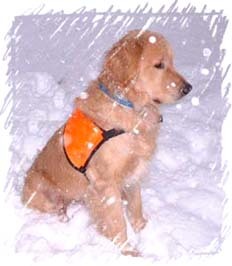 Nikies special abilities since September 11th have been recognized throughout the United States. On November 5th he was featured on National Public Radios All Things Considered. On December 11th an interview was recorded for CNN. On December 17th and 21st he was on Discovery Channels Animal Planet. The Washington Post featured his work on the front page of the December 19, 2001 National Edition: Victims at Risk Again: Counselors Scramble to Avert Depression, Suicides After September 11. On December 24, 2001, NBC Nightly News with Tom Brokaw produced a special segment featuring Nikies exceptional Ground Zero therapy techniques and how he helps volunteers cope with the stress of helping victims. Since October, National Geographic Magazine has been documenting and chronicling Nike. The Associated Press is photographing and writing an article on Nikie and K-9 Disaster Relief at Ground Zero. Diane and her wonderful group have been very busy working with families at Pier 94 in Manhattan. This is the location of the Family Assistance Center where families of those who lost loved ones or were affected by the World Trade Center disaster are receiving assistance. 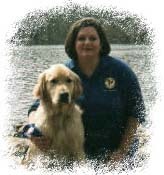 Diane wrote to me on December 28, 2001 about a youngster who was affected by the magic of her very own partner Hunter  an exceptional Golden Animal-Assisted Therapy Dog. The coordinator for the AAT Teams at the Family Assistance Center contacted Diane on January 6, 2003. This boy's family (as detailed in the following story) had gone to them to request that Hunter send a picture of himself to "Bobby". Diane and her organization are sending him a stuffed Golden Retriever (darn near life-size) in full H.A.R.T. uniform, to be his "Hunter Jr." for as long as he wants. There are too many stories to mention so I will tell you about my interaction with one young man as it has very much stuck in my memory. Ill call him Bobby  he's about 9 or 10 years of age. On one of the group's earlier visits, Bobby and his sisters were in the Childrens Corner with their mother. He was drawing, but stopped in order to meet Hunter. We sat for a few minutes chatting and talking about Hunter, Bobby then learning a great deal about him. When I asked if hed like to take Hunter for a walk, we asked his mother who decided to come with us. We walked around with Bobbys hand on the end of the lead (mine in the middle) and were being stopped by other staff and volunteers along the way. They began asking questions about Hunter and I directed them to Bobby for the answers. He began telling them where Hunter liked to be scratched and petted, where his favorite spot was and how if they fed him treats, their hand would get slimed. He really enjoyed that part. He then asked me to walk with him to the Wall of Bears (a wall of pictures and flyers of the missing, and notes from families) and took me directly to a flyer of his father. Bobby pointed and said Thats a picture of my dad, thats my dad. I felt my throat grabbing, took a deep breath and said I see your dad. His mother began to cry and we stood there, the four of us as Bobby comforted his mother, saying, Its okay, Mom. Itll be okay. I remembered thinking  When? When will it be okay? Wow, this kid is working to take care of his mom. We sat down in front of the Wall for a few minutes and I let Bobby lead the conversation, as we stroked Hunter on his side and belly. We continued walking and Bobby proudly answered questions about Hunter for anyone who asked. He was in control. Bobby had Hunter as his own for that hour. When all of the teams left together as a group, we passed Bobby and his Mom and saw that Bobby was now holding a large white stuffed gorilla. Mom then asked again for my dogs name to which I replied, Hunter. She thought that would be a good name for the gorilla. Bobby nodded his head and said Yeah, Ill call him Hunter. As we left, Bobby's mother looked at us and with tears welling in her eyes personally said, Thank you to each team member. I left that interaction thinking that it may have been the most important impact Hunter and I had ever made. At the center, there are so many stern appearing healthcare workers and fire and police personnel walking about. But, they typically stop in their tracks and immediately drop to their knees to hug or pet Hunter. I believe having a neutral, pure and organic source of comfort and affection  some CONNECTION in the midst of the circumstances  helps people to stop for a moment and BREATHE. As a result of the despicable acts of terrorism Sept. 11, the city of St. John's housed 5,000 of the approximately 13,000 air travelers who were stranded for several days in Newfoundland due to the closing of American air space. A myriad of people rallied together to support these people. 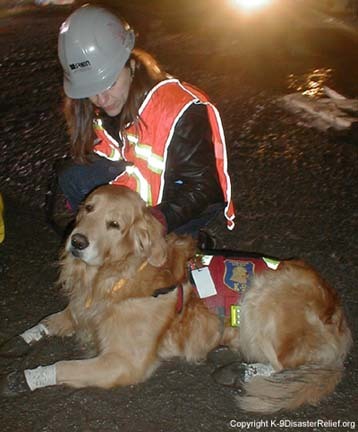 Canines reportedly made a major contribution in the rescue and recovery mission in New York. In our fair city, one dog in particular offered his services. 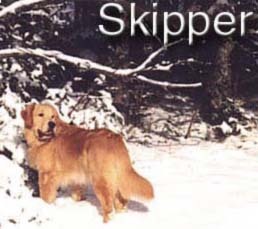 Skipper swept love into our hearts since he first entered our lives seven years ago, courtesy of Alan and Robyn Thorne of Saltwater Golden Retrievers. When there was a halt in air traffic, Skipper went to work in the role he has accepted for the past several years, as an internationally registered therapy dog. We were able to provide assistance by putting a twist in the routine, and encouraging people to talk about their pets, to reminisce about all that is good in their life and to consider what their pets have given them. People talked with me about the dogs empowering them. One man used hand signals to get Skipper to follow directions, and was surprised that Skipper would listen to a stranger. He thanked us for empowering him, because since the horrific events Sept. 11 he was left feeling powerless. Another man didn't even like dogs. At least, he didn't think he did until he met Skipper. He also spent a long time with Skipper, petting him and asking questions, amazed at his own interest. People came in and made a beeline to Skipper, asking if he wanted a bum-scratch. I knew these people where definitely dog lovers. Skipper has never had as many bum scratches in his whole life as he did during those special therapy visits. Another lady who was provided a Spanish translator spoke about her work. She trains Golden Retrievers for visually-impaired people. She would sit on the floor to cuddle with Skipper. People rubbing Skipper  as well as other therapy dogs  and telling animal-related stories alleviated some of the uncertainty in their lives. I was grateful to receive special permission to show the therapy dogs. They did make a difference. Skipper took time out of his busy play schedule and frequent swimming excursions to Paddy's Pond so he could provide some semblance of home, a sense of place, for otherwise there can be no peace, no comfort, no security and no rest. Skipper allowed these people to feel at home. We consider home the base, ground zero for happiness and success in life. The actual dwelling is inside us, and Skipper  through touch  rekindled that sense. Pamela Turpin (affectionately owned by Skipper) lives in St. John's with her three registered therapy dogs, with whom she makes visits to various institutions, such as hospitals, chronic care facilities and nursing homes.